Small multilayer ceramic capacitor with axial leads. 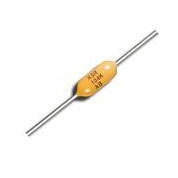 Rated at 0.1uF (100,000pF / 100nF), 50vdc, 5% tolerance. Measures approx. 4mm long x 2.5mm diameter. Image is sample only- color/size of actual part may vary.